Not to be confused with Heart and Soul (disambiguation) or Hearts and Souls. Heart and Souls is a 1993 American fantasy comedy-drama film directed by Ron Underwood. The film stars Robert Downey Jr. as Thomas Reilly, a businessman recruited by the souls of four deceased people, his guardian angels from childhood, to help them rectify their unfinished lives, as he is the only one who can communicate with them. In San Francisco, 1959, four despondent strangers embark on the same night trolleybus: Penny, a single mother, regrets working the night shift and leaving her three children at home; Harrison, a would-be singer, has backed out of an important audition due to stage fright; Julia leaves her waitressing job to seek out her boyfriend John, whose marriage proposal she rejected; and small-time thief Milo has just failed to retrieve a book of valuable stamps that he had conned out of a young boy. Their driver is Hal, who becomes distracted by an attractive passenger in another car and accidentally swerves the trolleybus off of an overpass, killing everyone aboard. At the same time, Frank Reilly is driving his pregnant wife Eva to the hospital. Frank avoids the trolleybus just before it crashes. The Reillys are safe, but Eva delivers their baby in the car. Hal ascends into the next life, but the souls of the four passengers are "attached" to the newborn baby, Thomas, for reasons they do not understand. Only Thomas can see and hear them, and they are forced to follow him wherever he goes. As the years pass, the four grow to love Thomas, and he them. As Thomas grows older, however, his parents worry about his obsession with his "invisible people" and consider having him committed. Realizing their presence is harming Thomas, the quartet decides to become invisible to him as well. The perceived abandonment causes young Thomas to avoid close relationships for the rest of his life, fearful that they, too, will leave him. Twenty-seven years later, in 1993, Hal returns with his trolleybus. Because his irresponsibility ended four innocent lives, Hal has been condemned to convey spirits to the next life, and he has now come for his former passengers. The quartet learns that they've been with Thomas all these years because each of them died with unfinished business: Penny never found out what became of her children, Harrison never conquered his fears and fulfilled his dream of public singing, Julia never told John her true feelings, and Milo never returned the stamp album, which would have freed him of the guilt from his life of crime. Thomas was meant to serve as their corporeal form, helping them to resolve their final business; if he refused to help, they were to inhabit his body and use it to solve their problems. After convincing Hal to buy some more time for them to rectify their unfinished lives, they reappear to Thomas, now a ruthless foreclosure banker who refuses to open up to his devoted girlfriend Anne. Thomas, who has since undergone psychotherapy to convince himself that his "imaginary friends" were only a childhood delusion, initially believes their reappearance means he has had a psychotic break. Ignoring their pleas, he attempts to check himself into a psychiatric hospital, where a schizophrenic patient is able to describe the spirits that accompany him. This convinces Thomas that the spirits are real, but he is still angry with them for their abandonment and refuses to help them. The quartet convince him by leaping in and out of his body during an important meeting and threatening further public humiliation until Thomas reluctantly agrees to help in order to finally be rid of them. Thomas is able to locate Penny's two daughters, but not her youngest child Billy, who was adopted after Penny's death. Milo uses Thomas's body to break into a house, steal back the stamp album, and return it to its now-adult owner. However, after the burglary, a nervous Thomas encounters a police sergeant (who is ticketing his illegally parked car) and accidentally gets himself arrested, forcing Anne to bail him out. Harrison uses Thomas's body to sing the national anthem at a B.B. King concert, after which Thomas is arrested again by the same police sergeant, who Penny suddenly recognizes as her son. Thomas tells Billy the location of his long-lost sisters, and Billy is so overcome that he lets Thomas go with a warning. Meanwhile, Anne, concerned with Thomas's recent bizarre behavior, demands to know what's going on. When he is unable to tell her, she breaks up with him. Finally, Thomas and Julia write a letter to Julia's boyfriend John in which she confesses her love for him, only to learn that John died several years before. At the same moment, the trolleybus returns to take Julia. Thomas protests that Julia's business is still unresolved, but Julia realizes that her true business is Thomas, who is making the same mistake with Anne that she made with John. Thomas promises her that he will tell Anne his true feelings before it is too late, allowing Julia to depart. Thomas invites Anne back to his apartment, where he admits his fear of abandonment and his love for her. As a symbol of his trust, he gives her a heart-shaped keyring containing all his personal keys. Anne forgives him. The two dance under the night sky where four new stars twinkle to show that Penny, Julia, Harrison, and Milo are finally at peace. The film was shot on-location in San Francisco, California. from December 1, 1992 to March 18, 1993. Parts of the film were also shot at Greenfield Ranch in Thousand Oaks, California. 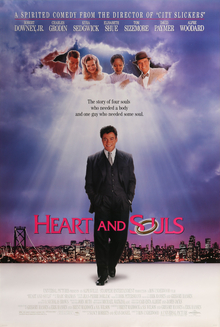 Heart and Souls was released on August 13, 1993 in 1,275 theatres. It debuted at #6 at the box office, grossing $4.322,250 million in its opening weekend. In its second weekend it landed at #8, grossing $9.395,270. After two more weeks in theatres, the film went on to gross $16.5 million worldwide in its theatrical run. Heart and Souls received mixed reviews from critics, as it currently holds a 55% rating on Rotten Tomatoes based on 22 reviews. Saturn Award for Best Actor - Robert Downey Jr.
^ a b c d e f g h i j k l Janet Maslin (August 13, 1993). "Heart and Souls (1993) Reviews/Film; A Yuppie Haunted (Really) By Other People's Problems". The New York Times. Retrieved July 10, 2014. ^ "HEART AND SOULS (PG)". United International Pictures. British Board of Film Classification. August 25, 1993. Retrieved July 18, 2014. ^ "Heart and Souls". Rotten Tomatoes. Flixster. Retrieved July 18, 2014.